Let’s start the new year right. Let’s start it by giving thanks for a wonderful 2015 that was chock-full of topnotch hoops action. Let’s go position-by-position and look at the best of 2015 in PBA basketball. In this post, I will talk about the guys who did really well in the Philippine Basketball Association. Perhaps they led their teams to conference titles. Perhaps they led the league in a certain statistical category. Perhaps they made history. Perhaps they did all of those things. 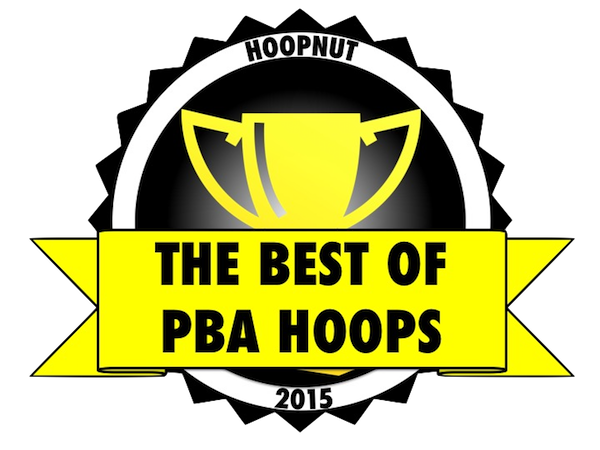 Here are the best of the PBA from 2015! - Let’s face it. June Mar Fajardo is the new face of the PBA. Heck, he is the new face of Philippine basketball. He repeated as season MVP and won two of three conferences last season. Right now, not surprisingly, he continues to be among the league’s most productive players, and the Beermen are among the top two seeds in the 2015-2016 Philippine Cup. And, finally, again, after the great snub of 2015, Fajardo is back on the Gilas pool. His legacy is in place and will only continue to grow. - Ranidel de Ocampo played a huge part in Talk N Text’s winning the 2015 Commissioner’s Cup. So huge, in fact, that he was named Finals MVP. He continued to be among the country’s finest stretch 4s throughout the rest of the season and earned another call-up to the Gilas team that bagged silver for the second straight time in the FIBA Asia Championship in China. He’s hurting now, sure, but once RDO returns, it’s a sure thing that he will gradually regain his old deadly form. - Alaska didn’t win any titles in 2014-2015, but they made at least the quarterfinals in all three conferences and placed second behind San Miguel Beer in both the Philippine Cup and Govs’ Cup. In short, Alaska had a wonderfully successful campaign. In fact, they ended up with the third-best record overall when the sun set on the season. A huge part of that success was Abueva, who continued to be among the league’s fieriest competitors. His production also rebounded after a bit of a slump in his sophomore season. Oh, and he also burst onto the Asian hoops scene in a big way donning the Gilas colors. - Romeo had a solid rookie season in the pros, but he upped his game across the board last season, breaking the bank as the Most Improved Player and making the Mythical Second Team. Don’t forget that he also wowed the crowds in the FIBA 3x3 tournament, the Jones Cup (remember the Jenny Yu thing? ), and the FIBA Asia Championship. He irritated a lot of people in college with what many viewed as an overly flashy style of play, but that same flamboyance was what made him so compelling and fun to watch. - No question. No doubt. No other. The best point guard in Asia remained the best in the league, the country, and the continent. Castro pocketed his third BPC award in the 2015 Commish Cup while also racking up the most assists and three-pointers made by season’s end. Of course, bagging his second straight FIBA Asia All-Star Five (the only holdover from 2013) was a fitting cherry to his grace-filled year. Oh, and in case you were wondering, he is still currently tearing up the league (despite TNT getting knocked off by Rain or Shine). - This 6’9 Tennessee product was already pretty good in his first tour of duty with Rain or Shine in 2014, but he returned last year to make an even bigger impact. Chism was rock-solid for the Elasto-Painters, putting up better numbers across the board and very nearly leading them to the Commish Cup title. Don’t be surprised if he gets another crack at it this year as he is still in his prime (he will turn 29 this June). "@PBAonTV5: Rain or Shine secures commitment from import Wayne Chism for 2nd conference https://t.co/bPZjcmaQWD pic.twitter.com/b1P7aM2beH"
- The former Nittany Lion and Indonesia Warrior lived up to his billing, bagging the 2015 Rookie of the Year with relative ease despite playing hurt for a significant chunk of the season. He showcased a brilliant all-around game, and he was even the stuff of trade rumors for a while after wowing everyone in the 2014-2015 Philippine Cup. His numbers this season have been even better, too. He is scoring 7 more points per game, grabbing nearly 3 more boards, and hitting nearly half of his threes. No sophomore slumps for this super athlete. - I want to give props to Alex Compton for doing so well with Alaska last season, but there’s no getting past the Beermen’s two titles and the fact that Leo Austria was at the helm of that. The former Adamson coach knows all the Xs and Os, based on what I’ve heard, he’s a helluva motivator, too. He seems to be the perfect guy to balance all the egos and mesh all the diverse talents of such a deep ball club, and one cannot argue with the results. - Two of three titles. MVP. Two Beermen in the Mythical First Team. Two Beermen in the All-Defensive Team. Defensive Player of the Year. Comeback Player of the Year. Best overall record last season. ‘Nuff said. In our next post, we’ll look at the best of the NBA from 2015. CLICK HERE FOR THE REST OF THE BALLER AWARDS!